Atiku Abubakar, Nigeria's 2019 presidential candidate. Presidential candidate of the Peoples Democratic Party (PDP), Atiku Abubakar yesterday vowed to privatise the Nigerian National Petroleum Corporation (NNPC) if elected on February 16 to stimulate economic growth. Atiku, whose vision is to make Nigeria a $1 trillion economy by 2023 if elected, said he would also privatise power and other critical national assets, adding this could only happen if Nigerians voted for a change of government. 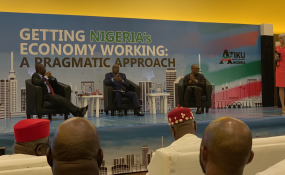 Addressing the business community with his running mate, Peter Obi, during a conference on "Getting Nigeria's Economy Working: A Pragmatic Approach," in Lagos, he argued that NNPC and the power sector must be disbanded through privatisation if they must be efficient. He assured of his commitment to privatising the two national assets and others "even if they will kill me." The former Vice President, who spoke against the argument that the oil and gas sector might turn out to be the economy's Achilles' heel, in view of entrenched corruption and drain on national resources, said: "Privatising NNPC would be to our advantage. We are not going to lose anything, but we will rather gain a lot." Besides, he added, if former President Olusegun Obasanjo had accepted his suggestion in 1999 and 2007, challenges in the power sector would have been fixed since 2005. "Nigeria would have been self-dependent on power since then because it does not need a centralised transmission plan, which is very costly, but a decentralised electricity system where each state or region is powered from the source of energy prevalent in the region. "But the former President preferred the gas turbines, which I noted, was a long-term system, as it is now obvious." He lamented the high rate of unemployment in the country, especially among the youth, saying: "Youth unemployment is a time bomb, and very scary," a situation he said, was responsible for increasing crime and criminal activities in the country. "The rate of unemployment at 23.1 per cent is the highest ever recorded in the history of Nigeria. The situation is worse for women and young people - with unemployment in the youth population at 33 per cent by 2050, 40 per cent of the world's poorest people will be in just two countries: Democratic Republic of Congo and Nigeria. We must take action to avert that." He insisted that creating jobs would not be a challenge, as he had already employed between 45 to 50,000 people in his private companies. He said he would invest heavily in information and communication technology to fight corruption, and automate government processes to reduce human interface with money, while also instituting greater transparency and efficiency in governance. Corroborating his views, Obi noted that there is nowhere else in the world where fighting corruption is an economic policy. "The country is more corrupt today than it was yesterday. Once the principal is not corrupt, you would have reduced corruption by at least 70 per cent. If governance becomes automated, all leakages in ministries, departments, agencies (MDAs) will be eliminated," he stated. On restructuring, Atiku said he was supporting the move to ensure reduction in the size of government, insisting, "I will ensure that I hand over some responsibilities to other components of government. That is why I am impatient to see that the country is restructured."